Richelle posted this video on her Facebook page. She talks about what it's like to be an author in Seattle, how she's connects to her fans through social networks and about her love for reading. I read this book when I was fourteen, and it opened my eyes in so many ways. It had never occurred to me then that you could take a great epic like the Arthurian legends and tell it via periphery characters—in this case, the women. This book also illuminates so many ideas about religion and spirituality that are as profound to me now as they were in my teens. The interview is also about her Succubus and Dark Swan series, but there aren't any spoilers if you haven't read the books. You can see more pictures and read more in Open Road's author profile about Richelle. I was just drifting off to sleep when I heard a little beep, and there it was, the second teaser quote from Spirit Bound! Penguin Paranormal Facebook posted it yesterday. So what do you think? What does it mean? It can't be Rose, because it's "me", not "her". Can it have something to do with Rose's connection with Lissa? I've said it before, but I think it's wonderful how accessible Richelle keeps herself to her fans. I clicked around and found a chat that she did on January 7th 2010 at the US Penguin website on the part of their website that's called the Water Cooler. I hadn't read the books when Richelle did this chat, so I didn't participate in it, but hopefully there'll be more chances in the future. Here are some of my favorite answers from Richelle. You can read the entire live chat here. Right now, there are no plans for VA to become a movie. It's nothing I can control since I don't own a studio! What I need is for a film company to make me an offer, and no one has. The characters are so unique to me that the actors would have to be unknowns. Who is in control in the books, you or the characters? definitely me. Some characters control their authors, but I'm the boss in my books! What's Dimitri's relationship with his family like? Good. He's the only boy in the family, so he was always protective and loved them. If you've read BP, you'll know they're all really close. Who is on the cover of Spirit Bound? the girl is Rose, and the guy? IT'S A MYSTERY! :) Can't tell you! Lissa is, actually. The books are built around Rose, and sometimes her stories dominate over Lissa's. Lissa also goes through so many changes that it takes a lot of care to write them. Who decides the book titles? For the VA series, it's a group effort, and groups always have a hard time deciding on things! My adults books are easier. Which of your books is your favorite one to read or write? It's the same for both writing and reading. Hands down: Shadow Kiss. It's the most powerful, tragic book in the series and I'm still astonished some days that I managed to write something like that. Is it difficult to write fight scenes? Yes! I've never thrown a punch in my life and know very little about fighting. I'm such a nerd I once did a Google search on "how to throw a right hook." How many pages will Spirit Bound be? Spirit Bound's looking like it'll clock in at 460ish pages. Twilight fans call themselves 'Twilighters'. What would we be as VA fans? ...hmm. VA fans don't have a name yet. You guys'll have to come up with one. What makes Dimitri so captivating? What's it like to write him? Dimitri's definitely fun to write! My favorite parts are him being exasperated when Rose says wacky things. Do you prefer writing adult books or YA? I like them both. I have a little more freedom with writing adult books, but YA characters have a lot of passion and enthusiasm that makes them fun to write. Can Strogois live as couples? They could live as couples, probably even romantic couples. But their natures are so aggressive that they'd fight a lot! Is it sad to end the series and know that you're not going to write about the characters anymore? Yes and no. Part of me's excited to move on to something new, but it's hard to let go of characters I've gotten to know. I feel sad for the readers sometimes too, but I hope everyone will like the next series too. Is it harder to write Rose or Georgina? How did you react when you found out you had a book on the New York Times Bestseller List? I was excited. It was insane. I was at a conference, hanging out with 10 other authors when I got the call. They all knew by my face what the news was too. NYT lists come out around the same time every Wednesday. Will we find out what happened between Janine and Abe? I might do a short story about that someday. There's an anthology coming out (not sure when) that has a short story about how Lissa's parents met. Did you ever imagine that your books would be this popular? How does it feel? all authors hope they'll be 'big' and have a lot of readers, but I never imagined the reality would be like this. It doesn't hit you until you see all the email and people at signings. It's so wonderful and I'm grateful to all of you for the support. If you had to describe VA in one word what would it be? What can you say about what happens with Adrian in the next book? the most I can say is that people who love him will be happy with SPirit Bound. There's a lot of him in there. Is Spirit Bound going to be as sad as Blood Promise? SB certainly has sad moments, but it's not quite as dark. It also has action straight out of the gate. It's like jumping into an episode of 24. Okay, maybe not quite like that, but it's fun. Where did you draw inspiration from to write a character like Rose? I'm a thinking person and consider all my actions carefully, so I thought it'd be neat to have a character like Rose, who is so the opposite. She jumps in and follows her gut, which gets her into trouble but is fun. Are you offended when your books are banned? I'm not offended at all by my books being banned. Some of the greatest books in history have been banned, so it's kind of an honor. 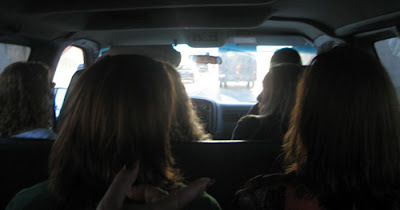 Today Richelle is in Columbus, Ohio at the Romantic Times Booklovers Convention. She posted on her LiveJournal about how fun it is to meet so many of her author friends at the conventions. Apparently there are two more conventions at the hotel: a Christian Women's convention and an undertakers' convention. How weird is that combination?! We've known for a while, that after The Last Sacrifice, the sixth and final book in the Vampire Academy series, has been released, there will be a spin-off series that takes place in the same world but focusing on a different character. The spin-off series will consist of six additional books. 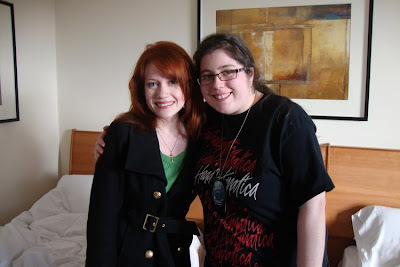 Vampire-Academy.com posted an interview that Wondrous Reads did with Richelle Mead at the Eternal Twilight 3 Convention earlier this year. 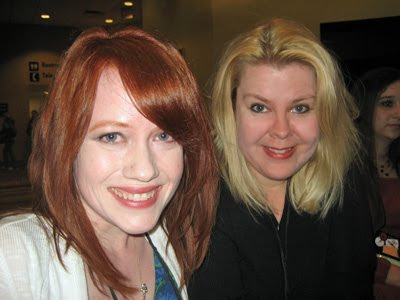 ShadowKissed.net posted a picture of Richelle and ProphecyGirl from Wondrous Reads. This is what Richelle had to say about the upcoming book Spirit Bound and about the spin-off series. WR: Can you say anything about the spin-off series? stop, and I can’t give that away. there anything you can tell us about Spirit Bound? Is it a big Dimitri book? So what do you think the 'OMG I can't believe that just happened' moments will be? In the interview Richelle also answers questions about whether the plots of her book are always planned out, how she got published, what her writing process is like, and about her signing tours among other things. It's a long interview, but a really good one!